A refreshing and back to basic way to experience a city is by urban camping, an emerging trend of spending a night or more outdoor in an urban environment. It is a lowbudget and unique way of experiencing a city. Import.Export Architecture (IEA) is a network of two architects Oscar Rommens and Joris van Reusel from Antwerp, Belgium. They investigated new urban opportunities and they came up with an URBAN CAMPING design. 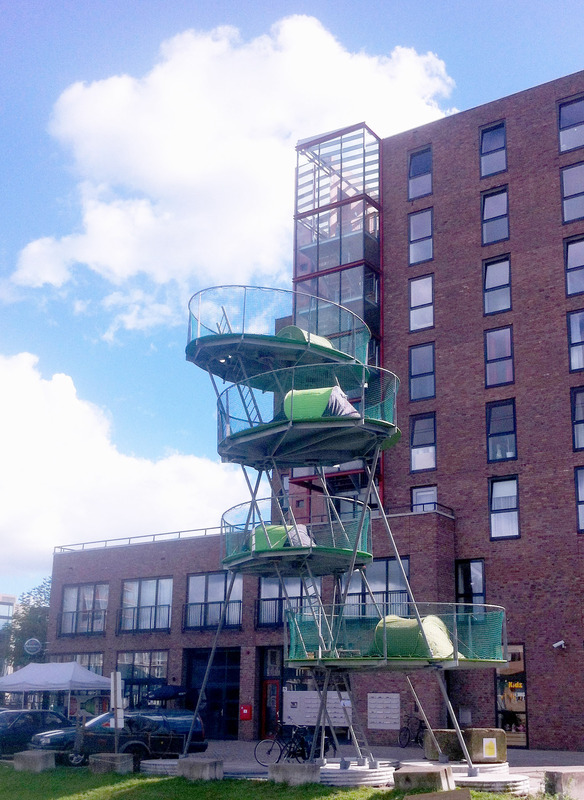 Last weekend it was shown during the design event INSIDE DESIGN in Amsterdam. Read the URBAN CAMPING design principals and watch the impressive installation being set-up here. Cleveland, Ohio was once the 7th biggest city in the United States, it’s population peaked with 914,808. In 1949 Cleveland was named an All-America City for the first time. The city’s prime geographic location as transportation hub on the Great Lakes has played an important role in its development as a commercial center. Picture below: Holiday Traffic on Euclid Avenue & Huron Road. Cleveland, Ohio. 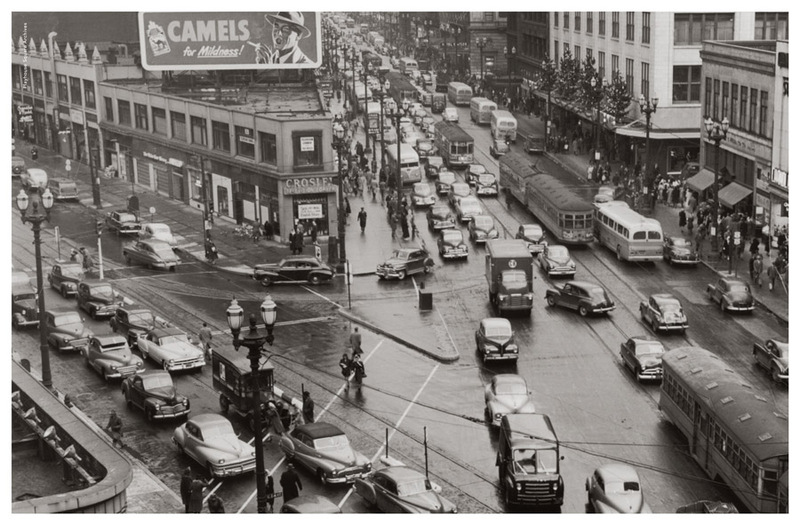 December 1949, PlayhouseSquare Archives. By the 1960s, the economy slowed, and residents sought new housing in the suburbs. Today the city is dealing with a fast declining population and land is left empty. Comedian Mike Polk, made this funny video about the city of Cleveland today. The nickname for Cleveland, The Forest City, unveils the river valley was once a heavily forested environment. A group of architects developed a plan to transform the city into a progressive city once again. 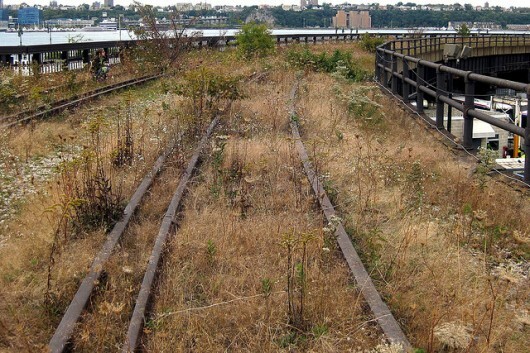 The High Line, an abandoned elevated rail line on the West Side of Manhattan New York, has not been in use since the 1980s. It was built in the 1930s, as part of a massive public-private infrastructure project called the West Side Improvement. 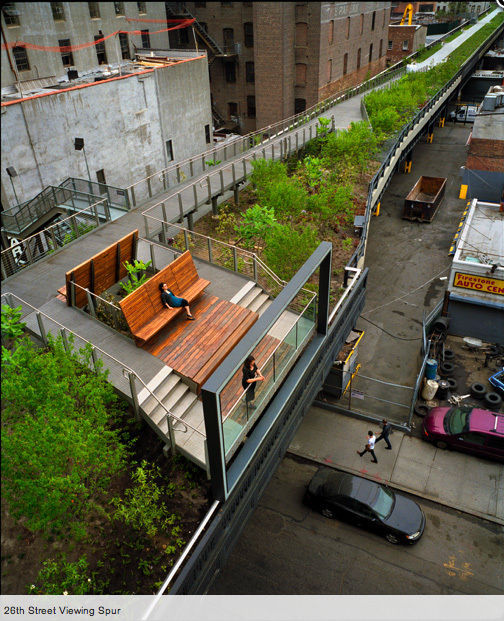 In 1999 a community-based-non-profit group called Friends of the High Line, initiated a project to redesign the High Line into a public parc. 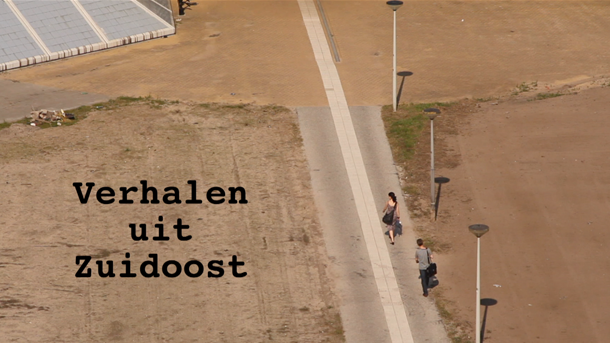 Piet Oudolf, a Dutch garden designer, worked on the planting design. His garden designs are like a dreamlike wilderness. The High Line’s planting design is inspired by the self-seeded landscape that grew on the out-of-use elevated rail tracks during the 25 years after trains stopped running. The species of perennials, grasses, shrubs and trees were chosen for their hardiness, sustainability, textural and color variation, with a focus on native species. It developed quite a following among urban naturalists and seekers after the unusual and novel. It was just this wildness, the sense of wilderness within one of the largest cities on earth, that captured the imaginations of so many. You can see an inspiring slideshow presentation of the design of the parc by clicking here. And watch a video on the history of the High Line narrated by Ethan Hawk. Below a picture on how the High Line used to look like, before the reconstruction.